The most up to date report regarding the causes of death of lawyers indicates that the top 3 killers of lawyers are heart disease, cancer and suicide, which mirrors the national average except that suicide is 3rd rather than the 10th leading cause of death as compared to the national average. Research reveals, however, that the top “lawyer killers” are primarily lifestyle related illnesses for which the risks associated with those illnesses can be reduced, reversed or eliminated through the incorporation of a plant-based diet along with other healthy lifestyle habits. The problem with trying to adopt new lifestyle habits for lawyers is time - we say to ourselves "I will get to it later" and later never comes. After having brain surgery in 2009 and fighting my way back to a complete recovery, I can say that if a lawyer does not choose to implement the necessary changes, that he/she will have recurrent visits to the hospital or doctors office to lament over the time that was not budgeted to invest in their health. Published by the Center for Creative Leadership 2007-2008 pilot survey. of lawyers were very dissatisfied with their fitness level. of lawyers rated their diets as unhealthy. wished their firm would do more to support their fitness and wellness. To learn more regarding the survey results attend an upcoming Healthy Lawyers Lunch and Learn seminar. As a survivor, I have launched, with the support of world renouned lifestyle physicians and centers, HealthyLawyers.org as an online healthy lifestyle resource and private social network to assist legal professionals (including paralegals and legal administrators) with stress management, work-life- balance, and the reduction of law practice related health risks through a whole person lifestyle and plant based dietary program called "The 10 Laws of Health" Program. From my personal battle with a brain disease and practicing law for 17 years with SLE Lupus relying only on natural remedies and food as my medicine, I am an expert on how obeying the 10 Laws of Health have saved my life and has kept me on the road of wellness, despite the bumps in the journey. It is true, forming new health habits is not easy. Psychologists report, however, that new habits are formed through a process called “context-dependent repetition,” which simply means that change results from repeatedly studying the learned behavior or information needed to make the change – which takes time. Solution? Healthy Lawyers.org, which provides the “context-dependent repetition” legal professionals need to form new health habits through the integration of live health events taught by doctors experienced in lifestyle medicine, reward programs and digital communication channels that deliver weekly health messages to encourage legal professionals to inculcate the 10 Laws daily. Healthy Lawyers is the legal professional's personal cheerleader that provides the needed "rah rah" support professionals need to stick with the health habits required to combat disease and manage the stress that comes from a hectic life. Medical research over the last 30 years has established that the 10 Laws of Health, which include a plant-based dietary lifestyle, can and does reduce anxiety, stress and can prevent and reduce many degenerative diseases. Healthy Lawyers will deliver resources on natural remedies that include food as medicine. The 10 Laws of Health is not a fad or temporary diet, it is a a set of legal principals that govern our lifestyle that if not obeyed result in sickness and disease. What makes Healthy Lawyers unique is that it is tailored to the needs of the legal industry and provides opportunities for lawyers and their clients to partner for the health of the legal community and to promote healthy lifestyles that sustain the environment providing a better future for our children. All are invited to take the 10-Day Challenge to jump start their journey to better mental and physical health that sustains our environment. We have created the Healthy Lawyer Network*, which is a private online portal where all legal professionals can create a profile to track their participation in the 10-Day Challenge, and participation in all Healthy Lawyer programs and services. The goal of the network is for legal professionals to share health enhancenent accomplishments through the posting of short blogs, videos, podcasts or publications to encourage other legal professionals to adopt the 10 Laws as part of their daily lives. P.S. Healthy Lawyers is a non-partisan group of lawyers who care about the health of legal professionals. Although Healthy Lawyers promotes a plant-based dietary lifestyle along with other health habits, it is not the intention nor are we qualified to provide medical advice nor to promote any set political health care policy or agenda, accept the agenda to help lawyers get healthy. All legal professionals are welcome to support the mission. Jo Saint-George is the founder of FHG Media Enterprises developers of Healthy Lawyers.org and the Minority Corporate Counsel Association Diverse Outside Counsel Database. Every year about 715,000 Americans have a heart attack. Of these, 525,000 are a first heart attack and 190,000 happen in people who have already had a heart attack.2Coronary heart disease alone costs the United States $108.9 billion each year.3 This total includes the cost of health care services, medications, and lost productivity. Stress as a contributor to heart disease has been accepted by the medical community at least since the 1984 with the publication of the book Type A Behavior and Your Heart by Drs. Friedman and Rosenman. Broken heart syndrome, also called stress-induced cardiomyopathy, can strike even if you’re healthy. Stress can be caused by external factors, like a death in the family, divorce, ill family member. Stress can also be caused by internal personality characteristics coined the perverbial "Type A" personality where a person may: over plan a day, try to do multiple things at once, impatience with delays. In either case, or in both cases, the stress can kill even the healthy person. Stress cardiomyopathy is a condition in which intense emotional or physical stress can cause rapid and severe heart muscle weakness (cardiomyopathy). This condition can occur following a variety of emotional stressors such as grief (e.g. death of a loved one), fear, extreme anger, and surprise. With cardiomyopathy, it is believed that the heart muscle is overwhelmed by a massive amount of adrenaline that is suddenly produced in response to stress. The precise way in which adrenaline affects the heart is unknown. It may cause narrowing of the arteries that supply the heart with blood, causing a temporary decrease in blood flow to the heart. Alternatively, the adrenaline may bind to the heart cells directly causing large amounts of calcium to enter the cells which renders them temporarily dysfunctional. Women are more likely than men to experience the sudden, intense chest pain — the reaction to a surge of stress hormones — that can be caused by an emotionally stressful event. Cardiomyopathy may be misdiagnosed as a heart attack because the symptoms and test results are similar. But unlike a heart attack, there’s no evidence of blocked heart arteries in broken heart syndrome. Although it is estimate that broken heart symdrome makes up only 1% of heart disease, the important thing to understand is that stress can and does kill. Frequently Asked Questions About Broken Heart Syndrome, Johns Hopkins Heart & Vascular Institute website. 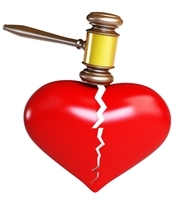 Is Broken Heart Syndrome Real? American Heart Institute, April 15, 2013. Behrens, C.B . et. al. (2010). Major depression as a potential trigger for Takitsubo Cardiomyopathy. International Journal of Cardiology, 15;140(2):40-2. Bybee, K.A. & Prasaad, A. (2008). Stress related cardiomyopathy syndromes. Circulation: Journal of the American Heart Association, 118:397-409. T.H.E. T.E.N. L.A.W.S. is an acronym for the laws that govern our being and for the natural remedies for stress and disease that are free to all. Those who attend the 10 Laws of Health Conference will be given the meaning of the acronym and will learn the specific laws that promote health and longivity. Register to attend! * 32-year old female associate dies from sudden heart attack - Above The Law, June 30, 2011. Dolan, M. (June 28, 1995). "Disenchantment growing pervasive among barristers," Houston Chronicle, 5A. The Lawyers Epidemic by C. Stuart Mauney published in the South Carolina Lawyers January 2012. Lawyers Personalities May Contribute to Increased Suicide Risk, by Debra Cassens Weiss published in the ABA Journal April 30, 2009. 15 Top Killers of Americans, by Madison Park – CNN Health writer/producer January 2012. The Female Lawyer Exodus, by Marlisse Silver Sweeney – Women In the World July 31, 2013. Busting the 21 Days Habit Formation Myth, by Den D. Gardner Sood, The Healthy Behavior Research Center, June 29, 2012.